WALNUT, CA--What’s better than sharing a Thanksgiving feast with your buddy? That’s just what happened at Westhoff Elementary on Friday. 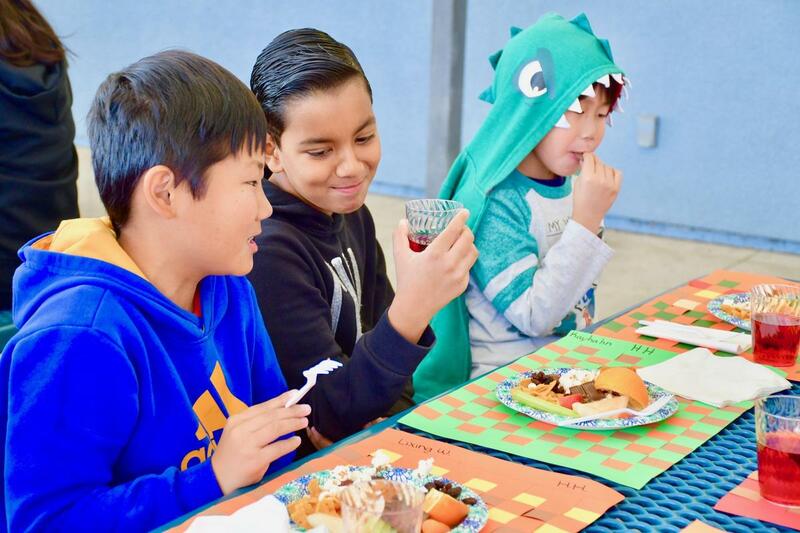 Once a month, the school’s first and fifth grade classes come together for STEAM (Science, Technology, Engineering, Art, and Math) challenges and fun activities. 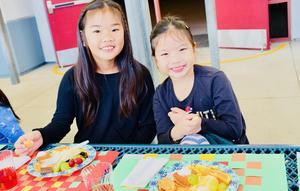 In December, the cross-age friends will be making beaded candy canes and wreaths, according to first grade teacher Amy Leinen. 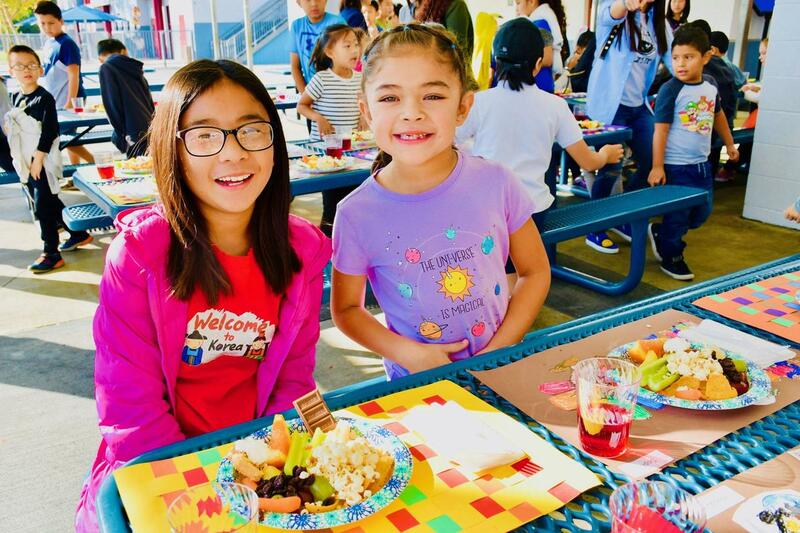 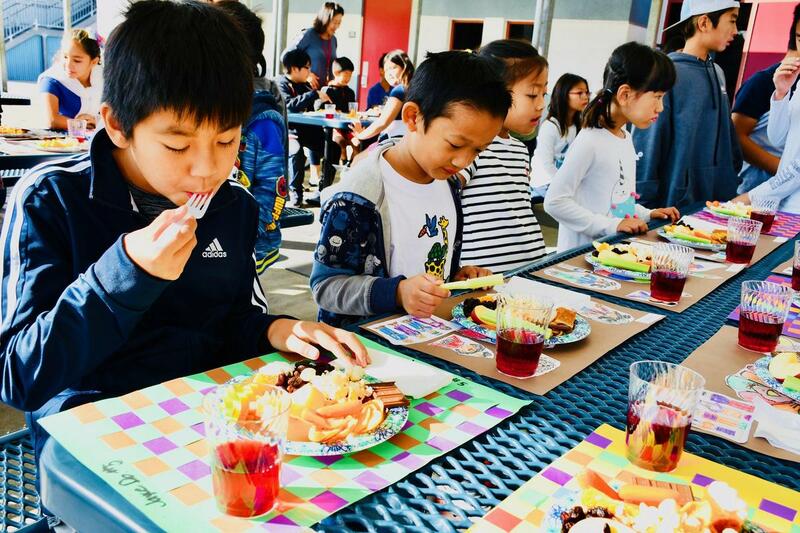 For the November 16 event, the 200 buddies watched the classic “Charlie Brown Thanksgiving” movie and then partnered up at lunch tables for a yummy treat. 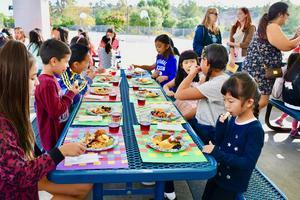 About 20 parent volunteers organized personalized placemats with plates brimming with popcorn, fruit and vegetable slices, raisins, chocolate, and pumpkin pie. Several children weren’t too busy crunching and munching to share things they are grateful for this holiday season. 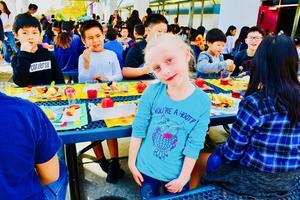 “I’m thankful for my buddy, Doris!” beamed fifth grader Chloe Afandor wrapping her arm around her young friend. 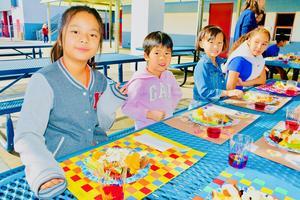 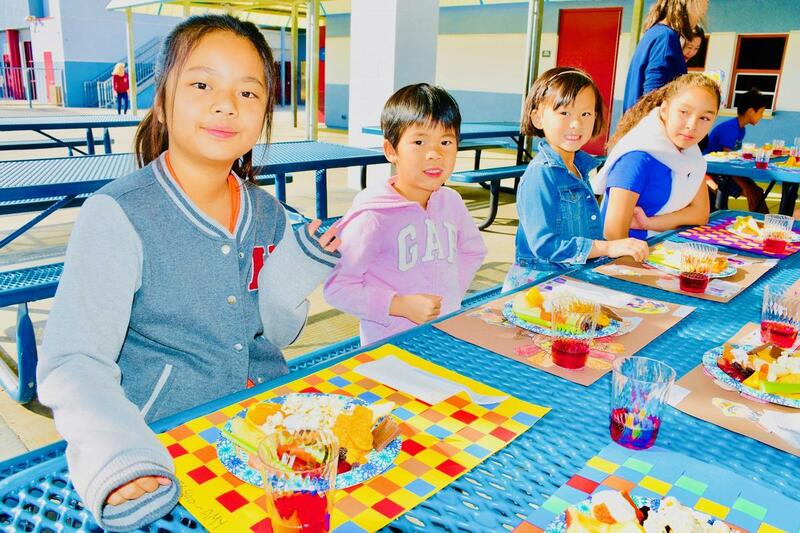 “I’m thankful for my mommy,” said first grader Devan Chen, age 6. “I’m thankful for my health and my family,” added first grader Alexandria Oliver. 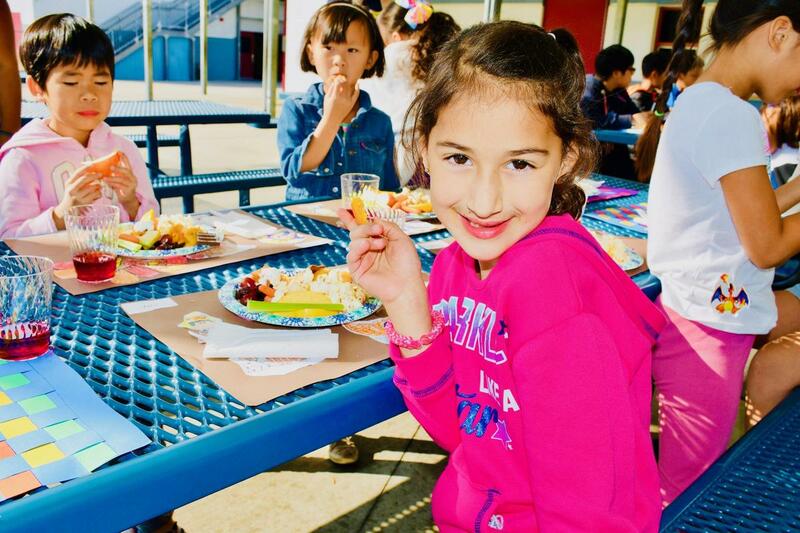 First grader Yara Sabha shared that she is thankful for her classmates. “They follow the Golden Rule and are kind to each other,” she said. 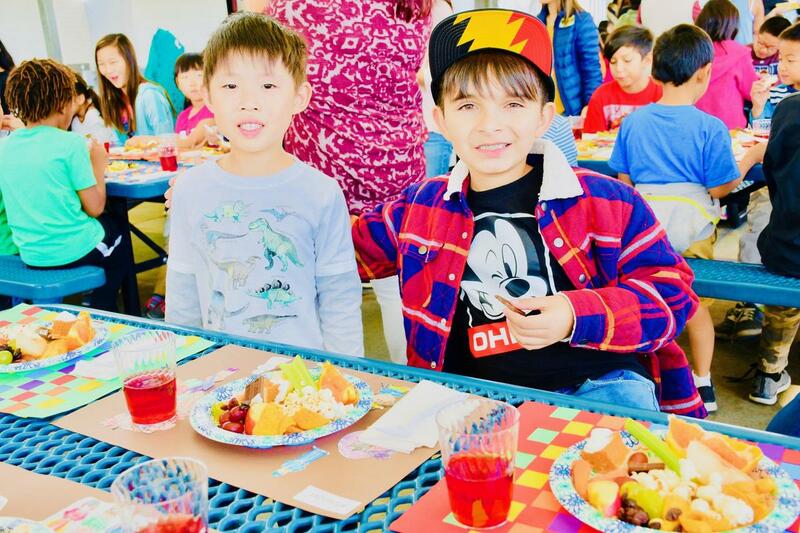 “I’m thankful for everything today – this feast is amazing!” exclaimed Rainie Yao. Westhoff Elementary first and fifth grade buddies share a Thanksgiving feast on November 16.